At first, the designer is glad to get a signed agreement for that new website. The client is glad they’re finally getting a new website. The designer is responsible for dozens of steps and details. 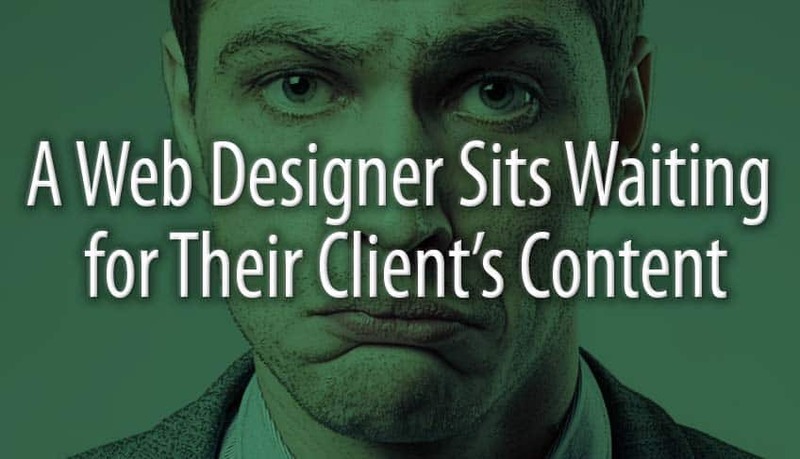 The client is responsible for one thing, the content. They promise it won’t be a problem to get it to the designer quickly. And that’s where it all falls apart. The people on the client side are super busy with their regular workflow. Those needed to answer questions are at a conference in Lithuania, or on maternity leave. Whoever’s lap this task falls in isn’t really sure what to say, what keywords are, or how to arrange all that information on their site. And no one’s making money while the project lingers on hold. Finally, finally, the client coughs up their content. It may just be a list of deliverables, and some vague, boastful claims that they copied from a competitor’s site. It contains a lot of insider terms and assumptions that clearly will bewilder their readers. It’s either way too thin, too ponderously long, or curiously inconsistent. There’s no indication of what goes on what page. A call-to-action? Didn’t occur to them. Read more about the risks. And a project that the designer hoped would go smoothly is shaping up to be a time-killer, a budget-killer, and with amateurish content gunking up their professional design, kind of a spirit-killer. What’s missing in this picture? Could it be a professional copywriter? True, not all companies want to pay a copywriter fee on top of the designer’s fee. Then again, when someone buys a new car, it would be cheaper if they didn’t have to pay for the engine, but then what would be the point of having a car? Although good web design helps establish the company’s identity and professionalism, it’s compelling, persuasive writing that tends to drive responses from customers. Without that, what would be the point of having a website? After all, the pairing of designer and writer for every web project is standard practice at most digital marketing agencies, who are then equipped to provide a complete strategic solution for companies rather than just the visual design and implementation of a website. A strategic copywriter can stand back find connections between the company’s underlying benefits, their customers’ sensibilities, and their competitors’ vulnerabilities. Employees and CEOs, limited by their insider bias, often miss these opportunities, and end up talking to themselves. A writer hired to produce the content doesn’t just make the client’s life easier. He or she makes designer’s life easier too. By working directly with the client, from the content discovery process to the review and revise phase, writers free designers from all that detailed back-and-forth. The designer simply hands the completed text to designer so they can use it as they build the site. No, the copywriting process isn’t immediate, because there are steps involved. But writers, like designers, are motivated to get projects completed and collect final payments. The copy can go through internal review and approval before it’s handed off to the designer. But for an even better experience for the client, it’s the first draft that’s uploaded to the development site. Clients can then see at a glance how everything will look together – instead of trying to assess a plain-text Word document separate from a lorem-ipsum-filled web layout. The client’s text changes can be made just as easy on the dev site as in a Word doc. A designer can hire a writer as a sub-contractor, and mark up their services. Or, as a partner, the writer can invoice the client directly, while the designer stays focused just on their part of the job. Writers who know how to attract and retain the reader’s attention can provide copy that indicates the emphasis, segmenting and sequencing of key messages. They can even supply wireframes for key pages. Either approach acts as a helpful guide for the designer. A writer can also organize all the client’s content into pages and sections. They can then provide a handy blueprint in outline form that lists the element of each page. This process often requires a longer, deeper dive than a lot of designers care to make. A web copywriter can also optimize pages and write SEO meta tags. That’s one less thing the designer has to worry about. Even if the benefits are clear to the designer, how do they convince their client to include a copywriter in the project? The best way is to simply include copywriting as a line item in the web design proposal, as a part of a strategic and great-looking website solution. This approach can often elevate the designer’s value and capabilities as a complete solution provider, compared with design competitors who are only able to do part of the job. In any case, if the designer thinks the additional cost might scare off the client, they can mark that item as optional or recommended. Or, they can offer a couple of options, including a budget plan that includes writing only for key pages, and recommendations for the rest. Explain to the client that while contemporary, professional web design will establish a fresh, unique company image, it’s insightful, persuasive written messages that turn readers into buyers. Send them links to the writer’s web resources that reveal the type of strategic perspectives they’ll want to benefit from. In fact, maybe send them so many helpful links about copywriting, strategy and SEO that they’ll realize they’re over their head, and perhaps, could use a little help after all. If the client still insists on providing their own content, you can give them a hard deadline that they may realize they can’t make on their own. Or, specify in the proposal that if the deadline is missed, a writer is automatically brought in. Tell clients that in your experience, websites that employ writers go smoothly and launch on time. That’s not the case when companies promise to provide content, then struggle more than they expected. Remind the client that their input and ideas are very important to the project, but it takes a copywriter to make sure those ideas are expressed in the most powerful way. Point out that not all websites need professional copywriters – only the ones in which the company is trying to persuade people to buy something or take an action. Then ask them about their goals for the website. Also remember that your main contact at the company may not be the person approving the budget. So ask the writer to provide a written rationale for hiring a copywriter that your contact can easily pass along to decision makers. Still have questions about working with a copywriter? Sometimes it just takes talking it through. In the meantime, to learn more about what a strategic copywriter can bring to the table, read An Atlanta Copywriter Shares 3 Surprising Secrets.